Ready to serve and savor. Right now. 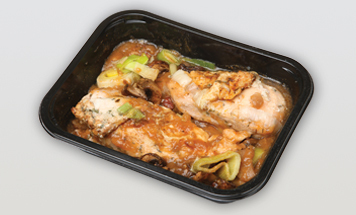 You won’t be there when they peel back the plastic or pop it in the microwave, but you can rely on our sturdy chilled or frozen ready meal flexible packaging solutions to hold up to your high standards. Whether delivered to the home or office, served in a school or on an airplane, your customers will be greeted by the nutritious meal they’ve come to expect from you. 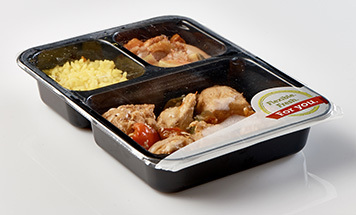 We know how to create ready meal packaging for a variety of uses. In the air, on the ground, for meals on wheels, or institutional use in schools or hospitals, our lidding films deliver. Stays fresh in the fridge and cooks through all the way. No hot or cold spots. Over the last few decades, we’ve developed some of the strongest, most reliable ready-to-cook packaging solutions. But we’re also in constant conversation with our customers about the ready meal industry of tomorrow. Ask us how our latest concepts might help you supply a more optimal meal. In a market where discerning customers have little patience for inferior products, our lidding and top web films films are the solution of choice for those unwilling to compromise on quality, aroma, and flavor. Let us work together to design your next ready meal package. Our Toplex lidding and top web films are designed for sealing to all packaging tray materials used for ready meals, including uncoated aluminum trays. Multilayer Vacuum Skin Packaging film featuring “second skin“, optimum gloss and transparency properties, as well as excellent sealing and mechanical advantages. Representing a new approach to ready meal packaging.